The moon reaches its full phase at 9:58 a.m. EDT (1358 GMT) Friday, marking the second full moon of August (the previous one occurred Aug. 1). Stargazers won’t be able to see two full moonsin a single month again until July 2015. Friday’s full moon won’t actually be blue, unless a load of dust or ash in the atmosphere lends it that particular hue from your vantage point. In any event, blue moons aren’t named for their color, and they look like any other full moon in the sky most of the time. Rather, the term has always been associated with an “extra” full moon. In the first half of the 20th century, for example,it apparently referred to the third full moon of a season — spring, summer, winter or fall — that boasted four full moons instead of the usual three. The phrase “once in a blue moon” suggests that the celestial phenomenon is exceedingly rare, but that’s not the case. Blue moons come along once every 2.7 years on average, and sometimes much more frequently. In 1999, for example, blue moons occurred in both January and March (with no full moon in February). 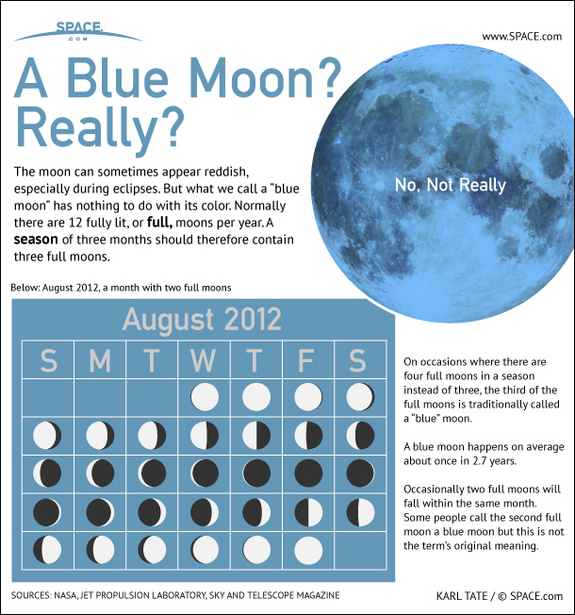 Blue moons exist because our calendar months aren’t perfectly synched up with lunar months. It takes 29.5 days for the moon to orbit Earth, during which time we see the satellite go through all of its phases. But all calendar months (except February) have 30 or 31 days, so occasionally two full moons get squeezed into a single month. Like this August. Or this September, if you live in the Kamchatka region of the Russian Far East or New Zealand. In those locales, Friday’s full moon actually occurs after midnight on Saturday (Sept. 1), making the following full moon — which comes along Sept. 30 — the blue one. If you snap any good photos of Friday’s full moon and would like them to be considered for a future story or gallery, please send them to SPACE.com managing editor Tariq Malik at tmalik@space.com.